If you follow me on Instagram, you know we recently attended Mickey’s Halloween Party at Disneyland. The kids had such a great time… Isabella loved trick-or-treating and even though Giovanni didn’t quite understand what was going on, he loved walking around like the big boy that he is now! Have you ever been to Disneyland before? There is a TON of walking involved! Bringing the right pair of shoes can make all the difference in how you end your day, which is why I always make sure to pack the most comfortable pair of shoes I have for myself. Can you believe I never really considered Isabella and Giovanni? Sure, they sit in a stroller for a lot of the actual walking, but the lines can be long with even longer wait times… Of course my kids should have a pair comfortable (and cute!) shoes. Lucky for us, we had received a pair of shoes for both Isabella and Giovanni from See Kai Run the day before we left for Disney. What’s so great about shoes from See Kai Run? Not only are they adorably cute, but they also meet the American Podiatric Medical Association’s standards for foot health and functionality. Basically this means that these shoes are made to to be lightweight, flexible and easy to put on without sacrificing style. This is so important for all children, but especially those who are just starting to walk, like my little man. As mothers, we find ourselves questioning more and more these days. Organic, non-organic? Screen time? Vaccinations?? There is so much to consider. See Kai Run helps eliminate one less worry from your plate! I picked out these gorgeous shimmery gold Avianna sandals for Isabella because I knew they would pair perfectly with her Princess Elena dress. When Isabella saw them, she squealed in excitement and couldn’t wait to get them on her feet! Isabella is totally into being a “big girl” lately and the velcro straps on these shoes allowed her to put them on herself. It was very exciting for her. For Giovanni, I chose their Dane red plaid high tops. I was a little nervous about these because Giovanni has a very wide foot. I’ve tried countless other high-top shoes before and have had to return all of them because I could not get his foot inside them. I was so pleasantly surprised that these shoes slide perfectly on his wide, chubby little baby foot! These shoes from See Kai Run are our new favorites around here! I highly recommend them to all of my friends AND I’m so excited to announce that I am hosting a giveaway on Instagram! One lucky winner will win a pair of their choice of shoes from See Kai Run! You can head over to my Instagram page Bellissimi.Bambini or you can enter by clicking here. Good luck to you all and thank you for reading along! I received the above mentioned item(s) courtesy of See Kai Run in exchange for a review. As always all thoughts and opinions are 100% my own. How adorable are these two?!?! I'm so bummed we didn't get to go to Disney last week but now I have time to get better walking shoes for my kids before we try again!!! Yes, these are the best shoes to keep your kiddos comfy! I love this brand! And these photos are to die for! Thank you so much, Shannan! I love BOTH pairs of shoes, but especially Gio's! Those might be the cutest pair of boy shoes I have EVER seen!!!! My kids could totally use some new shoes…especially nice ones like these! Love the pics you took of the kids! Oh my goodness, those red plaid high tops are just too cute! Those sandals are gorgeous and I never would have thought that they would actually be comfortable and practical too! I have been hearing such great things about these shoes! They look precious!! We love See Kai Run! Those red plaid shoes are just too much!!! See Kai Run is such a great brand! Your pictures are too cute! I love the Dane red plaid high tops so much, its hard to find cute boys shoes. I love this brand and i would choose Kristin if i win. Great post! I've never heard of See Kai Run, but I'll def. be keeping my eye on their brand now. Giovanni's shoes are adorable! My boy is just starting to walk, so I'm weary of shoving his foot into hard rubber shoes. Thanks for sharing! Your little ones are adorable! 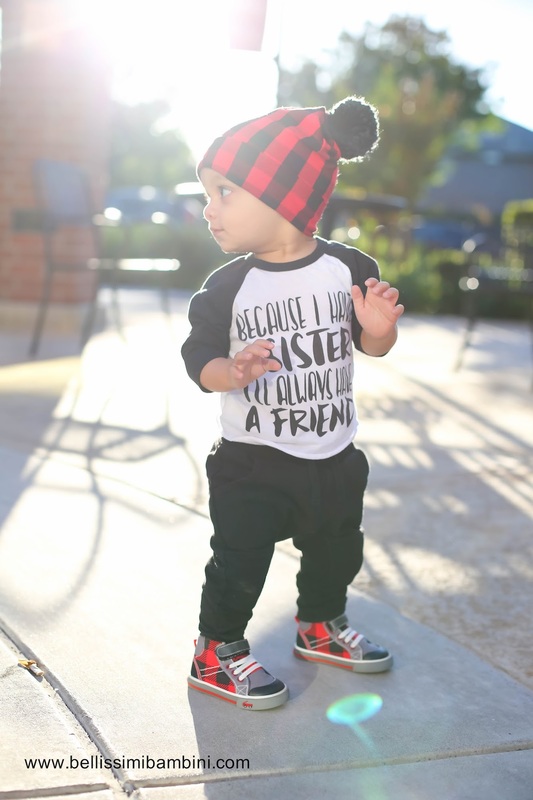 Your little boy's outfit is making me melt with all the cuteness! Love See Kai Run! Parker still has chubby baby feet at 20 months and she fits perfectly in this brand. Love both pairs you choose. Both these pairs of shoes are adorable! Lily has one pair and loves them. I think we need more! Loved learning more about these shoes! Those plaid shoes!!! I love those! These are so cute!! Those high tops are super cute. I'd love some for my 13 month old boy!! Both are adorable. I'm going to look into the high tops for my little one.